So now that the Persephone period is almost over and the magic date of January 15th is upon us, what does that mean? It means our day lengths are getting longer and January 15th is when we start getting 10 hours of daylight that will continue to get longer every day. Have you noticed already it now gets dark around 5:30 instead of 5 pm? The darkest time of the year is over. What does that mean to gardeners? To learn how to start cold hardy vegetable seeds super early outside and how also how to start them inside read on. 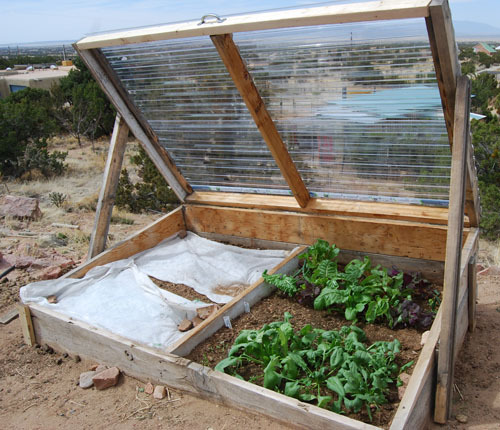 If you want to try growing cold hardy vegetables outdoors at this time of year, you will need a cold frame, low tunnel or hoop house. 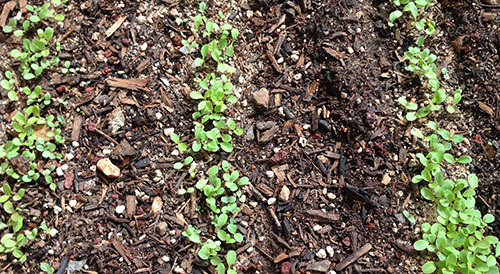 If you already planted cold hardy vegetables late last fall in a cold frame, low tunnel or hoop house, you may have noticed that the little seedlings haven’t been growing much at all as winter set in. Now with longer daylight hours, they will start to grow again and barring any devastating freezes, they will continue to grow and you can get cold hardy crops earlier this spring. In late winter, before you have harvest your winter crops, decide what you want to plant in your bed once space opens up in your cold frame. As the end of the Persephone period draws near (January 15) , you can re-seed the openings created from your harvesting or you could start planting seeds in your bed if you don’t have anything growing. My soil in my unheated greenhouse is at 40°F right now (as of January 12). Lots of cold hardy vegetables germinate in cold soil. They will be slow to start at first but they will start as your soil warms up to 40°F and warmer. Now with the day light getting longer, you can think about starting early. The winter sowing you do will be ready for harvest by early spring, often long before the same crop when grown outside without protection. A bonus is many of the cold hardy winter crops don’t like our springs, bolting on the first few warm days so you’ll be able to harvest that spinach before it bolts! Some cold-hardy plants planted inside a cold frame, low tunnel or hoop house can tolerate a hard freeze at night, provided they are allowed to thaw during the day. The plants must be completely thawed before you harvest them. In addition, put some winter row cover over seedlings at night to give them an additional 4-6°F protection even though they are already in a cold frame, etc. Remove the row cover on days when it is above freezing. Watering is necessary to get crops started, but they will generally need very little water during the winter season-early spring once established. I’ve already written about starting seeds inside on many earlier posts. The following list of winter vegetables to grow is from ‘The Winter Harvest Handbook’ by Elliot Coleman. These can be planted either as transplants (first started inside under lights) or outside as seeds in cold frames, low tunnels or hoop houses. This lettuce is from Johnny’s called All-Star Gourmet Lettuce mix coming in the greenhouse. In celebration of my FIRST CROPS coming up in the greenhouse, I’ve changed the background color on my blog back to green from winter blue. In my mind, winter is over although not officially – that won’t take place till the first day of spring on Spring Equinox on March 20 and of course we can still (will) get snow. No matter. I’m ready! I’m moving on and planting stuff (in the greenhouse). What kind of stuff? Read on to find out! These are a golden yellow pak choi (shakushina) from Kitazawa. They’re already a great yellow-green color and will make a wonderful contrast to the tatsoi. These first crops took about 12 days to germinate-they actually came up on March 1 so they were planted on Feb 17th. They are all still tiny but coming up nicely. The top picture is a lettuce mix from Johnny’s called All Star Lettuce Mix that’s suppose to grow out evenly. The second picture is a golden-yellow pak choi (shakushina) from Kitazawa. Also from Kitazawa are Pak Choi rosette (tatsoi) and white stem dwarf pak choi (both not shown). These were all recommended in Elliot Coleman’s book, Four Season Harvest (except the golden-yellow pak choi which I couldn’t resist because of the color). According to Elliot Coleman they all do well in cold greenhouses. I have winter weight row cover over them now to protect them at night. 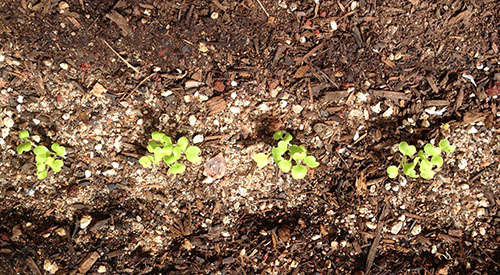 I also planted Winter Bloomsdale spinach from Southern Exposure Seed Exchange at the same time and it’s coming up way slower but the first 2 seedlings broke ground yesterday, on March 3. Ah, spring has sprung-and we got rain this week! What could be better?! I’m also going to plant transplants this week to see how they do in comparison to the seedlings. I’ll get pics later on that one.